Patience. Didn’t I pray for that last week? Dads! Both my own and the one who helped create our kids. This is what the crew made for their Dad for Father’s Day. DirtBike got a 98 on his first Spanish Quiz!! Yeah!! The kids went to a concert Saturday evening at the Botanic Garden to see Reckless Kelly. Here’s a big shout out to the Dust Bunnies – thanks for a super fun ride at Legacy on Tuesday evening! It was my first time on dirt there. I’ve always dropped off The Architect and Cherry Ames at the dirt trails and then ridden the paved trail with Mr. Pea, Princess Pea and DirtBike. The dirt trails are FUN!! Crossfit is still going strong. I so appreciate my employer who provides this perk for us. I jumped rope for three minutes, and didn’t trip once. That’s a minor miracle in itself! On the needles – back to the mitten, and it’s halfway finished. Then a test pattern knit for an adorable baby vest. Other creative things this week include repairing the broken jewelry that I didn’t get to last week. Maybe I’ll do some actual baking, as I really want some lemon bars. Oh! I need to make a new clothespin apron, too. Mine is fraying apart around the edges, so it’s time for a new one. I also need to stitch up a hole in the love seat in the family room. After twenty three years, the leather is wearing thin in spots. Watching Downton Abby. (I love Netflix.) Still reading the Adventures of Sherlock Holmes with DirtBike. Definitely some kayaking one evening this week with Mr. Pea and the boys. Still developing that water model for the City of Denison. Taking DirtBike’s glasses in for repairs. Orthodontist and dentist appointments. Grocery shopping again. Laundry. School physicals. Scouring the internet for the least expensive textbooks available for Cherry Ames, Princess Pea and The Architect. The gift your children made their dad is gorgeous. The lemon bars sound delicious and as for meatballs, well, they speak for themselves huh? Love your list! 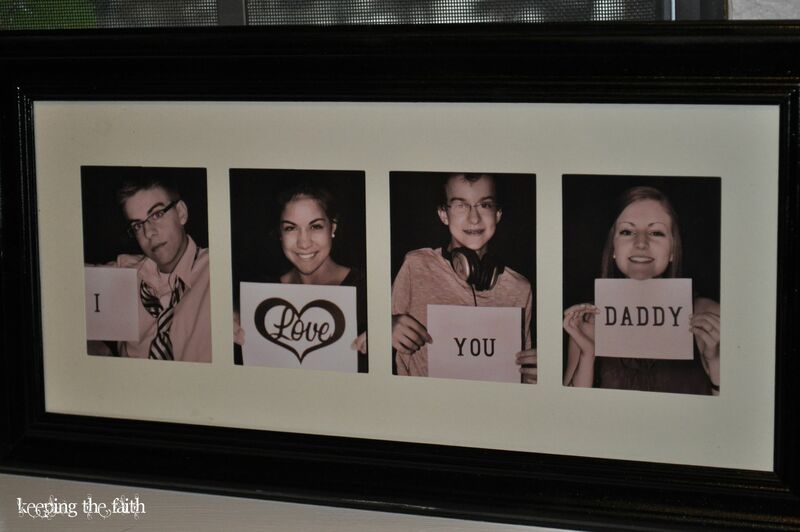 Especially the Father’s Day idea…so neat! I love the Minutes. So concise. I hope your hubby feels better. Go Angela with the jumprope! Thanks for your prayers. We had a great time in kansas with friends. Tomorrow we take the bike tour of Chicago and visit the aquarium.